Ensure a smooth and stress-free end to your Australian vacation with this pre-paid private departure transfer to Perth Airport. 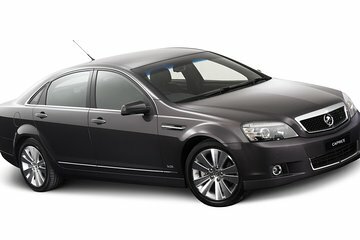 Your driver will pick you up from your Perth CBD hotel, help with your luggage and drive you to the domestic or international terminal in a spacious luxury vehicle. There’s no need to worry about late-night or early-morning flight departures, either – transfers are available 24 hours a day, seven days a week. A relaxing ride by luxury vehicle ensures a stress-free way to end your visit to Perth! I come to express my dissatisfaction for work performed in this transfer. Upon the transfer airport/hotel on January 03 communicated to the employee who performed the service, which would return the hotel to the airport on 06/01 at 1 pm. The next day, I got a hotel statement the transfer company had called to confirm the time of the return. Confirmed that would be 1 pm. On January 04, again the company called the hotel and asked to confirm the time, which shows a great lack of organization, and once again was told to 1 pm. Not only that, in day of the transfer, the company called back at the hotel, and this time, employees woke us at 5 am, to say that the company would get us at 12pm. We have faced the problem of the spindle, what directly influences the sleep and still wake up in time to receive a incorrect information, it was a dread. At 12 pm they were at the door waiting for us, I say they because had 2 drivers with cards in my name. The company that offered the service was Limousines Australia, represented by Mr. Warren Mack. In fact, he had no information regarding my flight, and these information were filled in Viator website at the time of contracting. I am reporting to you this occurred for not happen again, since hired two more transfer through Viator site and do not want to go through new disorders.